Are you a loyal fan of The Hen and have stayed with us in the past? Check out our Loyalty Reward Program! See why booking direct on our website will SAVE $$$$! Spring Lambs Coming Soon – join the contest! See our blog for details. Picking up or dropping off your student at the University of Wisconsin? 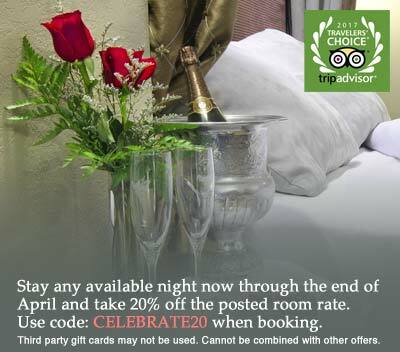 Why not stay with us and treat yourself too! 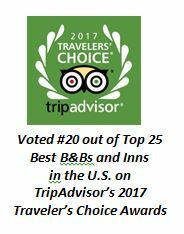 In addition to being voted #20 Best B&B in the U.S. in 2017, The Speckled Hen Inn has received a 2018 TripAdvisor Hall of Fame Award as well as the 2018 HotelsCombined 2018 Recognition of Excellence! Need a getaway close to home, yet feels like you’re away from it all? Visit the Dane County Farmer’s Market and see our blog for insider tips! Want a romantic getaway? Our suites have fireplaces and whirlpool tubs! How about a friends getaway this spring? Check out the property photos. Follow us on Facebook, Twitter, or Instagram for the latest on what’s happening at The Hen. The Speckled Hen Inn is a 20 acre Country Estate Bed and Breakfast located at 5525 Portage Rd., just outside Wisconsin’s capital city. The B&B is just 7.5 miles from the Capital Square and the campus of the University of Wisconsin and near the Dane County airport and Madison College. This country inn is the perfect place for a romantic getaway, birthday and anniversary celebrations, reunions with family or friends, business travelers, or for Moms and Dads looking for University of Wisconsin lodging. 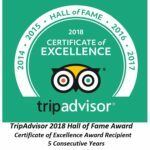 This Bed & Breakfast was named #20 Best B&B in the U.S. by TripAdvisor in 2017, Best B&B in Wisconsin by the LA Times in November 2017, Best of Madison Winner in 2018 & 2019, and recommended as a Must Stay in Midwest Living Travel Guide and received the 2018 TripAdvisor Hall of Fame Award for Certificate of Excellence Awards 5 years of running! The Speckled Hen Inn features 5 uniquely different Guest Rooms, offering private baths with whirlpool jetted tubs, and fireplaces. Guests may enjoy the lounge, library and dining room as well as the large gathering room with a guest galley kitchen, theater room, game/puzzle table, computer, and piano. This Madison bed and breakfast is well known for their outstanding farm-to-table breakfasts that showcase its many vegetables and fruits grown on the property as well as other local farms, meats and Wisconsin dairy products including locally made cheeses. The 20–acre property features pastures with sheep and llama, grassland and wetland areas, two creeks, spruce and pine plantations, orchards, walking trails and flower and vegetable gardens. There are many sitting areas, an outdoor picnic table, a temperature controlled gazebo, and a fire pit for our guests to enjoy. You will also see a number of happy Speckled Hens that produce the wonderful eggs featured at breakfast each day. Our Guests continue to love their stay and have written over 600 great reviews on TripAdvisor. Book your next stay with us and see why it’s a place you’ll return again and again.